Manchester United, A club where many unknown and young players have become Legends. Many players like Paul Scholes, Ryan Giggs, Gary Neville, David Beckham, Cristiano Ronaldo and most recently Javier Hernandez, who were practically unknown, before coming to Old Trafford. Like the players mentioned above, many didn’t knew about George Best when he was young. George was born in 1946 in Belfast, North Ireland. He was bought up with five siblings. In 1957, at the age of 11, the academically gifted Best passed the 11 plus and went to Grosvenor High School, but he soon played truant as the school specialised in rugby. Best then moved to Lisnasharragh Secondary School, reuniting him with friends from primary school and allowing him to focus on football. At the age of 15, Best was discovered in Belfast by Manchester United scout Bob Bishop, whose telegram to United manager Matt Busby read: “I think I’ve found you a genius.” His local club Glentoran had previously rejected him for being “too small and light”. Best was subsequently given a trial and signed up by chief scout Joe Armstrong. His first time moving to the club, Best quickly became homesick and stayed for only two days before going back home to Ireland. 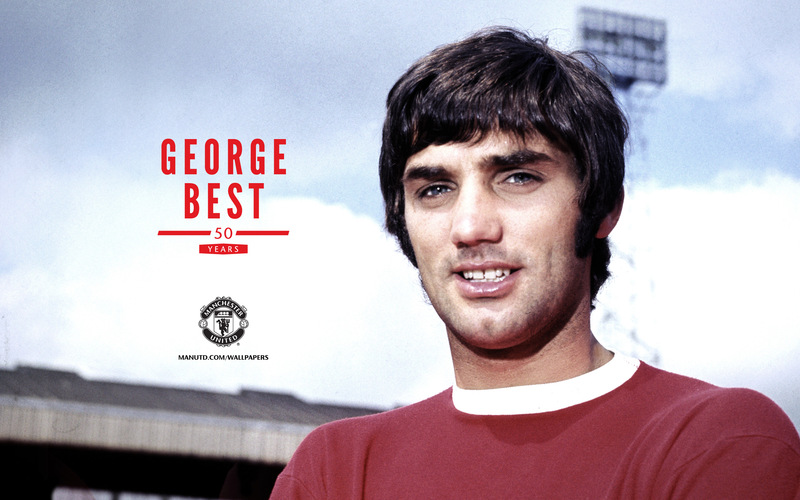 George Best was often referred to as ‘Georgie’ or ‘Geordie’ in his native Belfast. Other nicknames included the “Belfast Boy”. On 14th September 1963, at the age of 17, George Best made his Manchester United debut at Old Trafford against West Bromwich Albion. As Best was just 17-years-old, it was difficult for him to earn a regular spot in the first team. His second senior appearance came in December 1963 against Burnley. Best scored a goal in the 5-1 thrashing of Burnley that day. Sir Matt Busby used George Best more frequently after the New Year. Best finished the season with 6 goals in 26 appearances for Manchester United as his club finished second, four points behind Liverpool. George Best was in the headlines at the age of 20, after he scored 2 goals against Benfica in the European Cup quarter final in 1966. His talent and showmanship made him a crowd and media favourite. Known for his long hair, good looks and extravagant celebrity lifestyle, Best appeared on ‘Top of the Pops’ (a British music chart television programme, made by the BBC) in 1965. The 1966-67 season was a successful, as Manchester United claimed the league title by four points. The following season, Best became a European Cup winner after scoring in the final against Benfica. United won 4–1 and Best was later crowned European Footballer of the Year and Football Writers’ Association Player of the Year. After this, his steady decline began. During his spell at United, George Best wore the no.7, no.8, no.9, no.10 and no.11 jerseys. The reason he wore so many different kit numbers was because Best played at United when shirt numbers were assigned to positions, in the traditional English way, and not the player. When Best played at right wing, as he famously did during the later stages of the 1966 and 1968 European Cups, he wore the number 7. As a left winger, where he played exclusively in his debut season and nearly all of the 1971-72 season, he wore the number 11. Best wore the number 8 shirt at inside right on occasion throughout the 1960s, but for more than half of his matches during the 1970-71 season. He was playing at inside left (wearing the number 10) in 1972 when he famously walked out on United the first time but was back in the number 11 for the autumn of 1973 before leaving for good. Best even wore the number 9 jersey once for United, with Bobby Charlton injured, on 22 March 1969 at Old Trafford, scoring the only goal in a 1–0 win over Sheffield Wednesday. In 1974, aged 27, Best quit United for good. His last competitive game for the club was on 1 January 1974 against Queens Park Rangers at Loftus Road. Including Manchester United, George Best played for 18 clubs during his footballing career of 21 years. He also scored 9 goals in 37 appearances for his National side – Northern Ireland. Best suffered from alcoholism for most of his adult life, leading to numerous controversies and, eventually, his death. In 1981, while playing in the United States, Best stole money from the handbag of a woman he did not know in order to fund a drinking session. “We were sitting in a bar on the beach, and when she got up to go to the toilet I leaned over and took all the money she had in her bag.” In 1984, Best received a three-month prison sentence for drunk driving, assaulting a police officer and failing to answer bail. He spent Christmas of 1984 behind bars and turned out as a player for Ford Open Prison. Best was diagnosed with severe liver damage in March 2000. In August 2002, he had a successful liver transplant at King’s College Hospital in London. The transplant was performed at public expense on the NHS, a decision which was controversial due to Best’s alcoholism. The controversy was reignited in 2003 when he was spotted openly drinking white wine spritzers. On 20 November the British tabloid News of the World published a picture of Best at his own request, showing him in his hospital bed, along with what was reported to be his final message: “Don’t die like me”. Best’s “farewell” message was seen as a way of warning others not to risk suffering a similar fate as a result of alcoholism. On 25th November 2005, George Best passed away due to a Kidney infection at the age of 59. Best scored 179 goals for Manchester United in 470 competitive appearances. He also won two League Championships Winners Medals and the European Cup of 1968. He was also voted European Footballer of the Year in 1968. In February 1970, Best netted a record breaking 6 goals in a single match against Northampton Town in the FA Cup 5th round. The game ended 8-2 in favour of United. This record still hasn’t been broken by any player yet. In 2007, GQ (A monthly men’s magazine focusing on fashion, style, and culture for men.) named him as one of the 50 most stylish men of the past 50 years, and in 2011 he was voted Best Manchester United Footballer On Earth. Without any doubt, George Best is one of the greatest and most colourful people who have played football, and was once described by footballing legend Pelé as the greatest footballer the world had ever seen. He is still one of the best looking and famous soccer players ever. This was a little article which gives you an overview about one of our greatest Legends of all time.